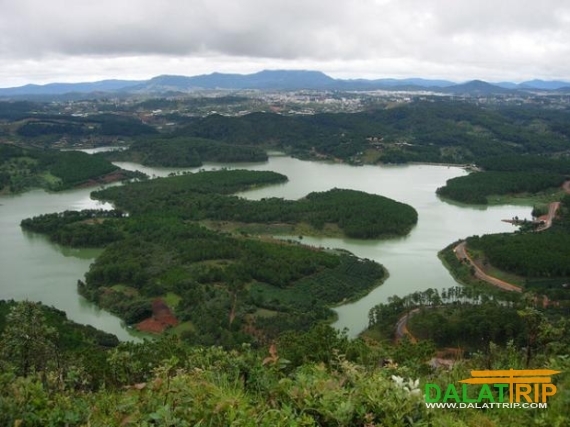 In Dalat, beside Langbiang mountain, there is also another one which is named Elephant mountain with its height of 1,756 meters. Elephant mountain has been mentioned for many times in some legends of ethnic minority people in the central highlands. Lach people said that in the old time, their ancient chieftain-Mr. Lang who live in La Ngu Thuong region-was very wealthy intelligent and kind-hearted. Especially, he was so good in conquering wild animals such as elephant, tiger, snake, etc… when he was 14, he successfully conquered two wild elephants which came from La Ngu Ha region to his region to disturb. After that, he convinced them to come back their village and advised them to do the good things. Until he was 20, he rescued Ms Biang – a daughter of chieftain of Sre ethnic minority people – from danger. Since then, they loved each other and people of La Ngu Thuong region soon knew about that. People, animals, plants-all of them were vary glad for the news. Especially, the two elephant of La Ngu Ha region that had been conquered by Lang were very pleased and happily waited for Lang and Biang wedding. However, they was no wedding. Because they were at different tribes, Biang couldn’t get married to Lang. Biang sadly said to her father that she would never get married to any one if she couldn’t marry Lang. Then, Biang and K’Lang decided to oppose their costumes by the death. They sat together on the mountain top until they were dead. People, animals and plants in La Ngu Thuong region wore mourning for them. The most remarkable thing was that the two elephants of La Ngu ha region. Their hope to attend Lang and Biang wedding disappeared. They were very sorrowful when hearing the news of Lang and Biang death. They tried to continue their way to present at the funeral. However, they were too exhausted and died near Ba Thao mountain. Then, their dead body turned into two mountain. So people called this place “Elephant mountain”. where is prenn pass in dalat ? what is prenn pass in dalat ?